Our Budget park and ride option can SAVE YOU MONEY by you dropping off your passengers and luggage beforehand and we just transport the driver only. Our Budget park and ride starts from only £30 per week. The Budget park and ride option is only available for customers travelling by Scillonian and those who are parking for a minimum of 1 week. 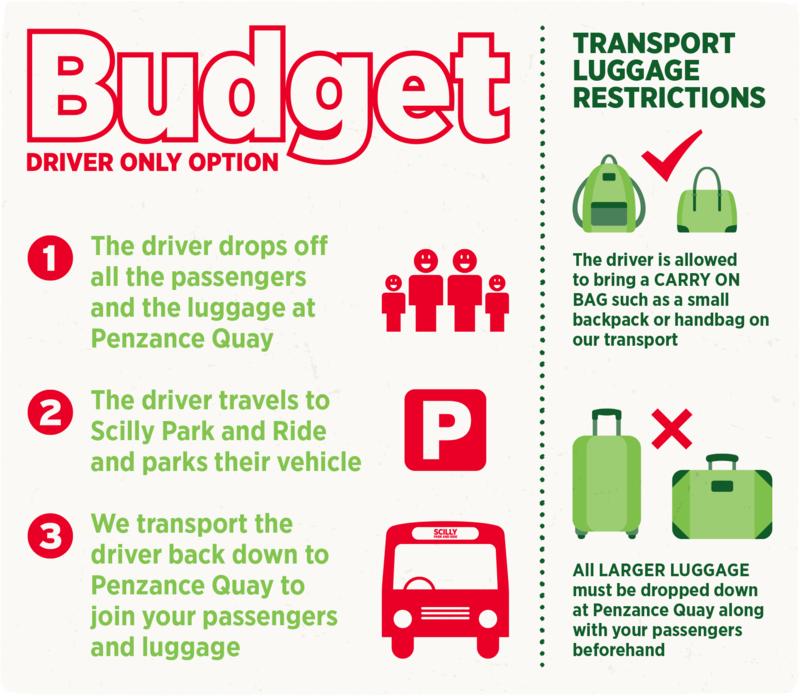 This option will suit customers who can drop their passengers and luggage to Penzance quay i.e campers, divers, kayakers or customers with cycles. This service is the same as our existing car park and ride arrangements but we will only transport the driver with NO luggage and NO passengers. This means the DRIVER OF THE VEHICLE ONLY. If you arrive with any other passengers you will be charged the full amount on that day. Car park is open from 7am please ensure you are with us by 8am. This is for a 9.15am sailing. Saturday Summer Sailings: Open from 7.45am. Please ensure you are with us by 9.15am for a 10.15am sailing. If you have different sailing times to the above please call us. Upon arriving in Penzance, please drop your luggage and passengers at the quay. Then make your way to Scilly Park and Ride. SAT NAV Users: TR20 8AW. Please ensure that only the DRIVER takes the vehicle to Scilly Park and Ride. Once you have parked your car our inclusive bus transfer service will take you back to the quay. Please ensure you take your keys with you. PLEASE NOTE: If you arrive at Scilly Park and Ride with any of the above equipment, extra passengers or luggage you will be asked to take it all down to the Quay and this may result in you missing the Scillonian Ferry. The reason we can offer this service at a discounted rate is because we are transporting the DRIVER only. On return from the Scillies the driver needs to get off the Scillonian ASAP. Our return transfer service will be ready and waiting at the end of the quay to take you back to your car. (Look out for the Scilly Parking minibuses). This return service is for the driver only, who will be taken to collect their car. Co-passengers and luggage will need to wait on the quay until the driver returns. By the time you get back to the quay you will be able to safely pick up your family and luggage. PLEASE BE ADVISED THAT ONLY THE DRIVER WILL BE TAKEN BACK TO THE CAR PARK. Please do not try and bring other passengers/luggage back with you.